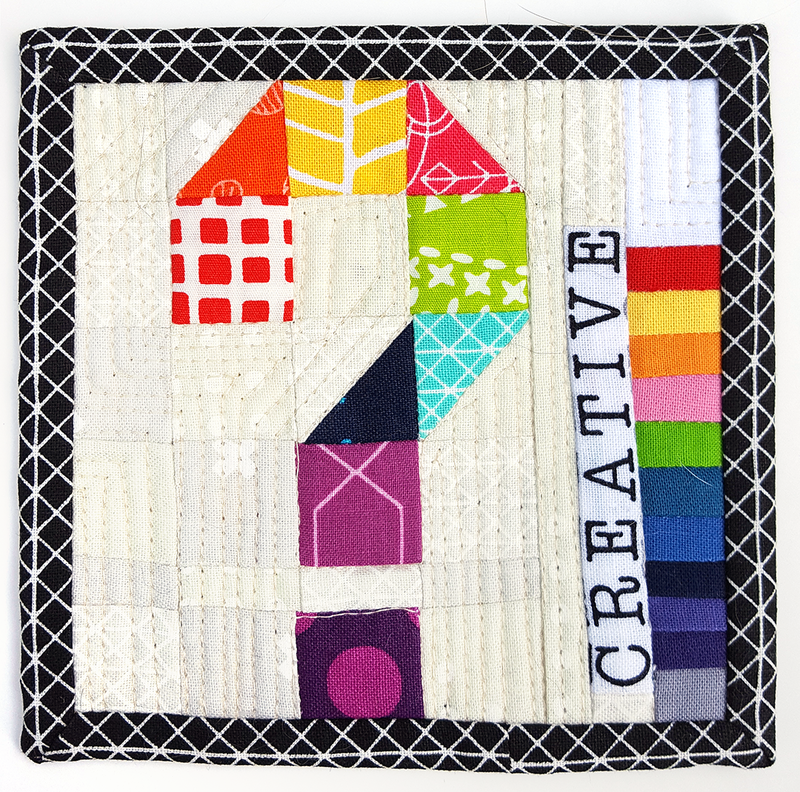 The latest issue of Make Modern recently came out and included an article on the mini-mini quilt movement that was happening late last year and included some of my own work which was really flattering! They also put out a mini-mini challenge which has kick started the movement again, and it’s been really fun seeing what people have been making. 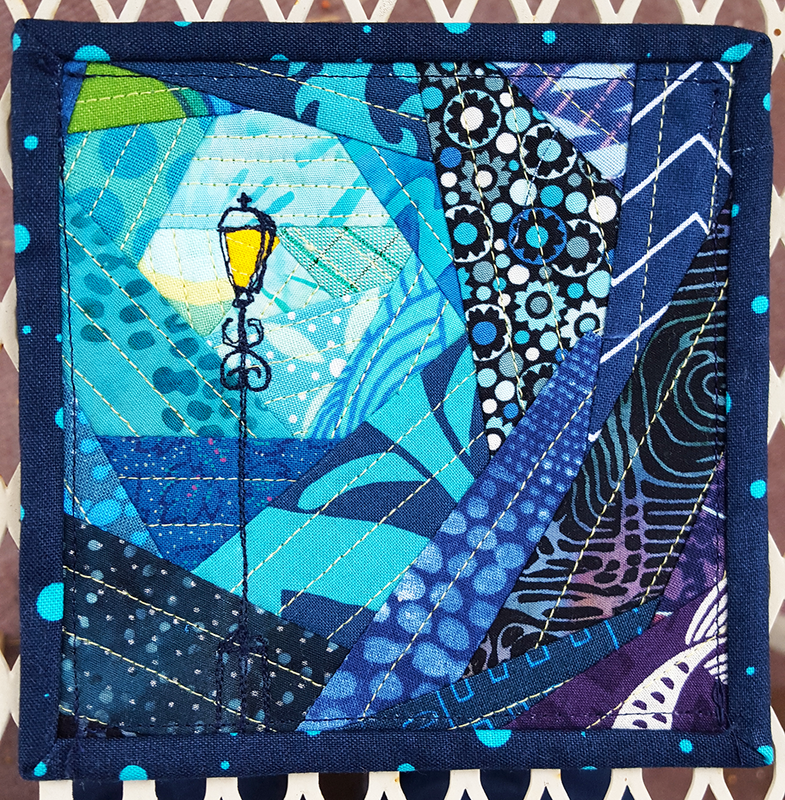 However, it also has brought to light that I’ve done a terrible job sharing my own mini-mini quilts on the blog. So I’m here to fix that. 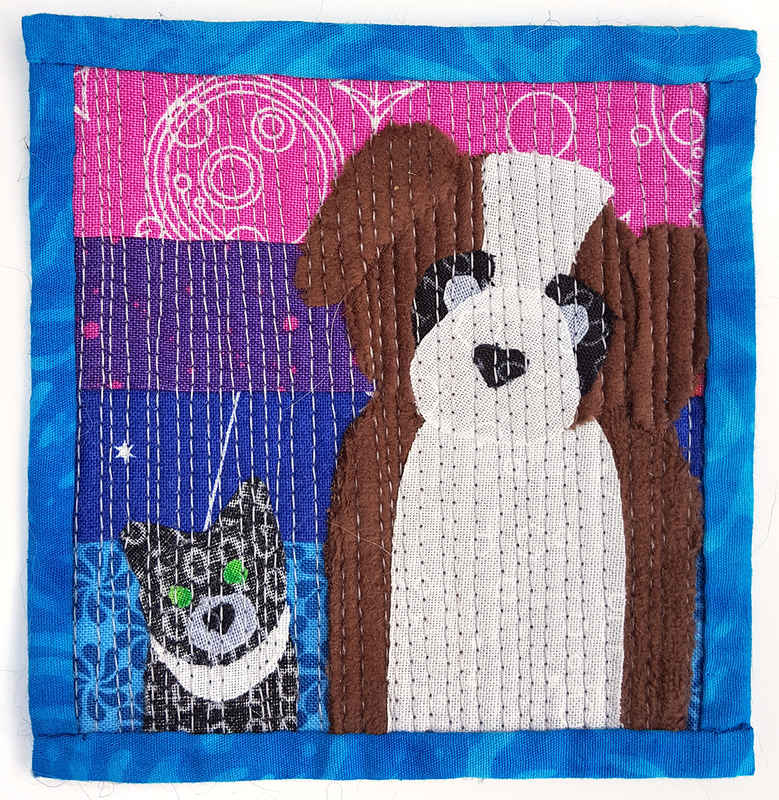 The first one I made was for Yvonne @ quilting jetgirl. This one got its own blog post, so if you want to know more, you can read about it there. The second one I made was for Jayne @ twiggy and opal. I’m a huge fangirl of Jayne’s work, so I was super happy to have a chance to swap with her. 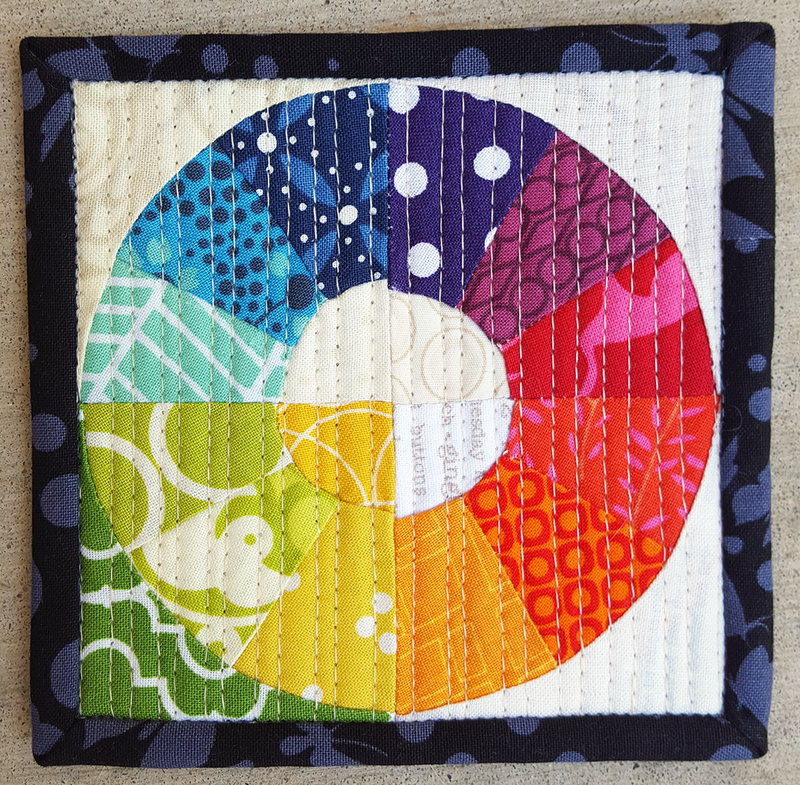 She asked for bright colors and “control with a twist.” I decided to make a color wheel as controlled color, but add “a twist of lime” to the greens section. This is pieced, and it was making this that made me realize that while I don’t mind working with curves, working with curves at 2″ finished is not something I’m going to seek out in the future. The third (and currently last) one I made was for Shauna @smoobug. She didn’t ask for anything which kinda broke my brain a little bit. I’m a person who makes my own challenges all the time because “open-ended” is not something I handle well. In the end, it turns out we both geek out on the same shows, so I made her a Benedict Cumberbatch/Sherlock mini-mini. And then it got returned to me THREE TIMES by the post office because apparently they lie about a package needing to be over 3/4″ thick vs a thick envelope being less than that and I finally just drove to her house in the middle of the night and put it in her mailbox which felt kind of creepy but whatever because it made it. First up, from Yvonne, I gave her “friendship” as a theme. At the time I was going through an out-of-the-blue and weirdly drama-filled time with someone I had considered a friend and it left me feeling really off-kilter and unsure about my other friendships. 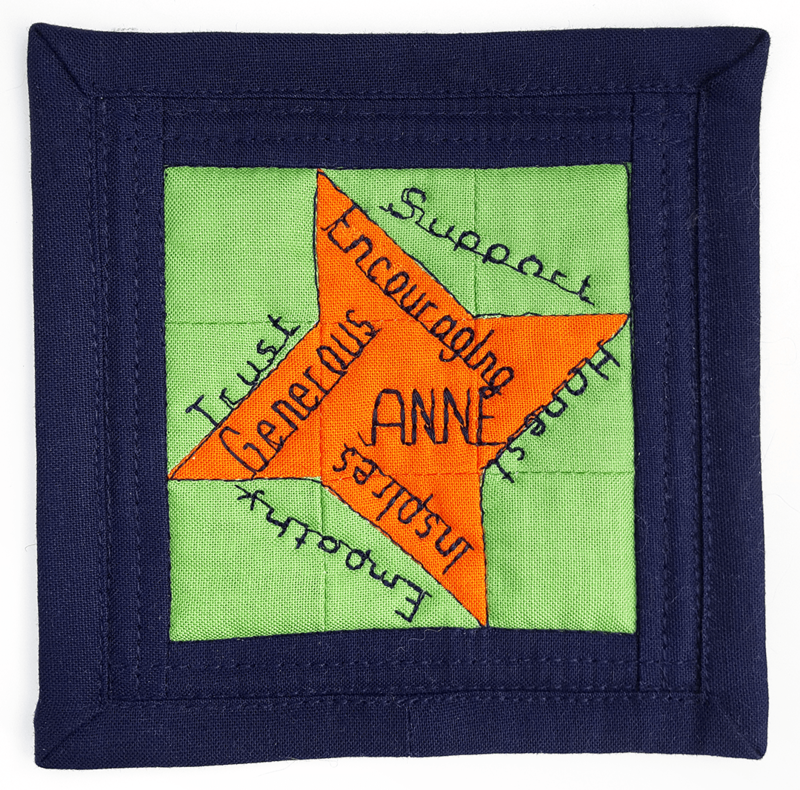 Well, Yvonne took it up a notch by not only making me a friendship star (natch) but also chatting with my close friends and asking for words they’d used to describe me. She then stitched them onto the mini. I hadn’t told her what was going on at all, but she somehow managed to make the perfect salve anyway! From Jayne, I gave her the theme of “creativity” and she made this beauty. I love the question mark, as creativity is so much about questioning and experimentation. The back has a special message she put there for me, and it makes me smile every time I see it! And finally, Shauna didn’t get a theme and so she went with what I’m obviously all about: hair color, my dog, and my cat. hahahaha it’s so perfect!! The brown fabric also has a bit of a fuzzy feel to it as well, kinda like my pup. Now that the mini-mini quilts are making a comeback, I might have to make a few more. They sure do come together quickly and they’re a great way to experiment with new design ideas! Are any of you making mini-minis for the challenge? What a fabulous post! I wish you had mentioned how large, or tiny, these are. Are you planning to make more? I cannot pick a favorite – they are all splendid! I didn’t mention the sizes because I didn’t remember to measure them and since I don’t have them, I can’t measure them now. 🙁 I know they are all under 6″ x 6″ and each one got smaller. 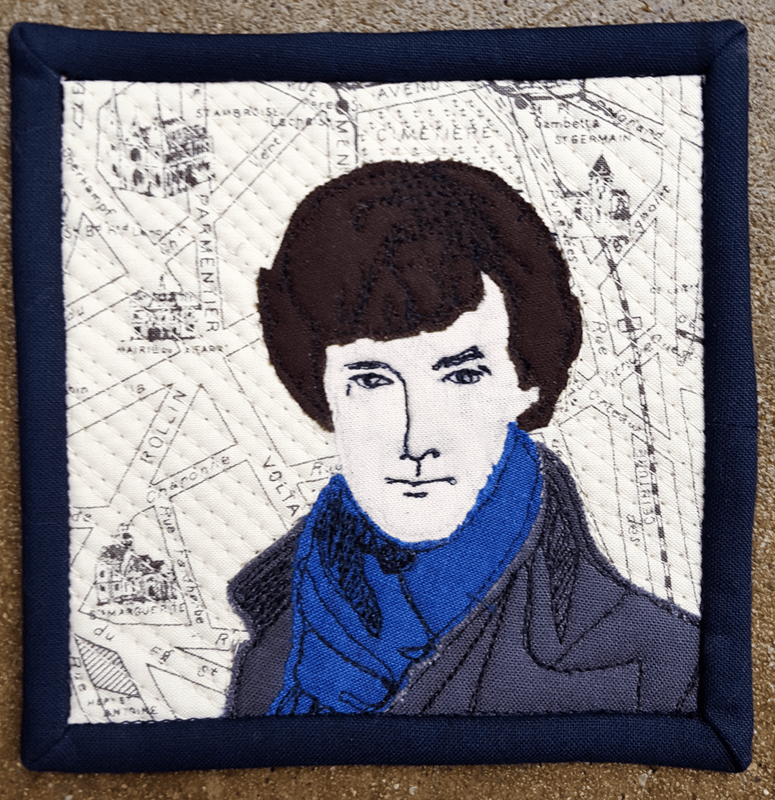 I think the Sherlock Holmes one is about 4.5″ x 4.5″? I’d love to make more, and hope to in a few months. 🙂 They’re great for trying out different ideas! How fun seeing all these mini minis again! I agree with Yvonne! Only 3? You have way more self control than I do! I laughed out loud when I read that you actually drove to her house! I am wondering of course how many states away she lived and how much time was invested in that delivery, since living in rural Maine, I’d be spending days driving to any quilty swap recipients’ houses!! But what a hilarious story! I don’t blame you one bit, either! Mailing is a BIG hangup of mine, too. I’ll have a project finished and ready to go for days, weeks, sometimes sadly months, but want to include *just* the perfect package accoutrements and it sits and sits. Either way, gorgeous makes. When I finally make it through my pile of promised obligations, I’d be up for a no timeframe, no stress about mailing swap. If you are, of course. No pressure, and I won’t be ready to join in until 2017 prob. Maybe sooner, if I’m on point with staying on task! Thank you! It’s so nice to have something that’s a finish after just a couple hours. Nice break from those big quilts. 🙂 I hope you’ve touched your machine by now! How do you define mini-mini? What size range? Love! Each and every one of them! 🙂 I took so long to get on the mini mini bandwagon… glad there’s a second wave. Addictive.